Ehsanul Islam Sadequee delivered an hourlong monologue before sentencing Monday. Atlanta, Georgia (CNN) -- Two Georgia men, including a former Georgia Tech student, were sentenced to 17 and 13 years in federal prison Monday for supporting terrorism. "This is not about your faith," U.S. District Judge William Duffey Jr. told Ehsanul Islam Sadequee, of the Atlanta suburb of Roswell, in imposing his sentence. "This is about your conduct. This is about the rule of law in this country that you have decided does not apply to you." 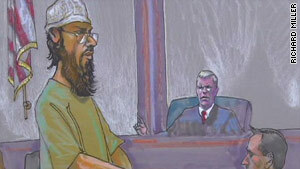 Sadequee, 23, was convicted in August on four counts of supporting terrorists and a foreign terrorist organization. His co-conspirator, Syed Haris Ahmed, 25, was convicted in June of conspiring with Sadequee to provide material support for terrorists in the United States and abroad. The two were charged in the same indictment. Duffey sentenced Sadequee to 17 years and Ahmed to 13 years in separate sentencing hearings Monday, delivering stinging rebukes to both. Sadequee, a Virginia native of Bangladeshi descent, sent an e-mail seeking to join the Taliban in its fight against U.S. and coalition forces in Afghanistan in 2001, while he was living in Bangladesh, prosecutors have said. In 2004 and 2005, Sadequee -- then living in Georgia -- "entered an illegal agreement ... with others to provide material support to terrorists engaged in violent jihad," authorities said in a statement following his conviction. Authorities alleged that the two traveled to Canada in March 2005 to meet with three co-conspirators they found online. While in Canada, federal prosecutors said, the men talked about their plans to go to Pakistan "to attend a paramilitary training camp operated by a terrorist organization ... as preparation for engaging in violent jihad abroad or in the United States." "They also discussed potential targets for terrorist attacks in the United States." In addition, Ahmed traveled to Pakistan in July 2005 with the goal of entering a terrorist training camp. He was unsuccessful in getting into such a camp and returned to the United States. Authorities also have contended that Sadequee and Ahmed made "casing videos" of landmarks in the Washington area, such as the Capitol, the World Bank Building and a Masonic Temple. The videos were found on the hard drives of at least two men who were convicted on terrorism charges in the United Kingdom. According to prosecutors, those two men had a large quantity of "violent jihad materials." In one of those videos, Duffey said, Sadequee drives past the Pentagon while discussing "what your brothers had done on 9/11" with no regard for or remorse over the innocent people who lost their lives in the terrorist attacks. Both men are subject to 30 years of supervised release after their prison terms, Duffey said, and during that period, neither will be allowed to use any device to connect to the Internet. Prosecutors recommended that Sadequee be sentenced to 20 years in prison and Ahmed 15. Assistant U.S. Attorney Robert McBurney said after Ahmed's sentencing that he was pleased with Duffey's decision, calling the sentences "meaningful ... for two dangerous individuals." Ahmed's sister, Samia, said she thought the sentence was "extreme" and noted that no crime was committed. "I believe they're being punished for their thoughts and their speech," she said. Sadequee's sister, Sonali, said both young men are "a source of inspiration to all of us." She said young Muslim men often search for a deeper understanding of issues. "In that search, in that curiosity, there's speech that seems questionable," she said, but is not, once it is explained. Given an opportunity to speak before being sentenced, Sadequee delivered a sermon of sorts, stretching to nearly an hour, on the true nature of Islam and God's vengeance on those who contradict his will, quoting from the Bible and the Quran and breaking into songs in what seemed to be Arabic several times. "In my speech, I have not and will not request for any sentencing because it does not matter to me. ... I have intended to speak about who is in fact the true authority and why I am here to begin with," Sadequee told Duffey. "I submit to no one's authority but the authority of God." Ahmed attempted to mitigate his sentence, however, calling his mother to the stand to explain what she meant during a phone call between the two, a transcript of which was entered into evidence. The woman said she was giving Ahmed permission to travel abroad for Islamic studies, not for the purpose of jihad. Ahmed also told Duffey that he'd had time to think about "a lot of things" while in custody and that violence "is not helping Islam. It's not Islamic. Killing random people, this is not the way." He noted, however, that he is against some American policies -- but not the people, "who have all this time been nice to me." "What has happened here today is a testament to the greatest democracy in the world," Duffey said, referring to the two defendants standing up in court to give what he called their "distorted view of America and American people." The judge said he did not believe the characterizations of defense attorneys advising Ahmed -- who like Sadequee chose to represent himself at sentencing -- that he was a naive young man manipulated into joining a jihadist organization. "Did you falter? Yes, you did," Duffey told Ahmed. "Were you going to overcome your faltering? Yes, you were. ... You are just one of many threats that face this country." There was no attack, the judge said, but "it's because you were stopped." Protesters on Sadequee's behalf unfurled a banner outside the courthouse with a quote from his closing argument, in which he denied ever being a terrorist.